Spirit of Manila was granted regulatory approval by the Civil Aeronautics Board (CAB) of the Philippines during the hearings for designation and entitlement to fly to two destinations in Asia and three destinations in the Middle East. In five separate filings, the Pampanga-based airline sought the Civil Aeronautics Board’s (CAB) approval to fly to Macau in China, Taipei in Taiwan, Kuwait, Bahrain and Dubai in the Middle East. This approval will make Spirit of Manila the newest International scheduled airline of the Philippines and the 2nd Philippine carrier to fly to the Middle East. Spirit of Manila is the latest Filipino-owned airline company offering scheduled international passenger services from Manila to key Asian and Middle Eastern Countries. The airline is based in the Clark Special Economic Zone at Diosdado Macapagal International Airport (DMIA) in Clark Field, Pampanga. Company officials said "That with this approval, it will strengthen Spirit of Manila’s presence in Clark, giving more available flights to Overseas Forign Workers (OFWs) and travelers that is based in the Central and Northern Luzon areas, and make the Philippines an even more attractive destination for tourism and trade." 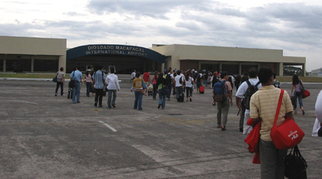 About 533,000 passengers flew through Clark's sprawling Diosdado Macapagal International Airport (DMIA) in 2007. Clark International Airport Corp. is planning to build a P4 billion terminal in the former US naval base that can accommodate three million passengers yearly by year 2010. The DMIA in Pampanga is being primed as the next premiere international gateway. Clark is strategically located to accommodate travelers from Northern and Central Luzon, home base to some 2.1 million OFWs whose aggregate remittances of US$ 5.6 billion a year account for almost 40 percent of the total US$ 14 billion dollars sent home by workers abroad. Spirit of Manila, the latest Filipino-owned airline company offering flights from Manila to key Asian and Middle Eastern countries, is set to establish a 1 billion Philippine Peso hangar facility that would service its fleet of aircraft at the Clark Civil Aviation Complex. Top officials of Clark Development Corporation and Clark International Airport Corporation, led by President Victor Jose I. Luciano and General Manager Bienvenido G. Manga, graced the groundbreaking rites and time capsule laying ceremonies at this ecozone over the weekend. Spirit of Manila Airlines president Juan C. Paraiso III said the initial investment of US$ 20 million is to operate aircraft maintenance center to ensure regular “C” and “D” checks of its aircraft and accept third party works. Together with its technical partner from the leading MRO provider in Europe and the U.S.A., Spirit of Manila started the project construction recently. Upon completion next year, the facility will be the largest in the country in terms of accommodating large wide bodied aircraft for a single structure hangar. It can accommodate Airbus 380-800 and Boeing 747-8. The facility will generate more jobs in its construction, operational and maintenance phases. The project will complement President Arroyo’s vision and grand plan to develop Clark as logistics and services hub in the Subic-Clark Corridor and the development of Disodado Macapagal International Airport (DMIA) as the country’s next international gateway that aims to serve millions of passengers. This bold drive, based on five-year term vision and solid plan, creates a bright future for Spirit of Manila which aims to be one of the dominant service providers in the highly competitive airline industry in Asia.